Planning on throwing some mega parties? Then you’re going to need a place store all the beer! 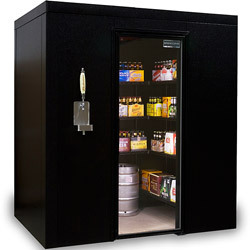 The Brew Cave Walk-In Beer Cooler & Kegerator gives you room to store 4 kegs and over 30 cases of beer. This climate controlled beer heaven also comes with a dispensing system to possibly make it the world’s largest kegerator!